Confectioners in Signes for five generations, the Fouque family like to transmit the passion of the nougat. In the beginning, the Fouque institution had various activities such as making biscuits, candies, fine pastries, candied fruits, syrups and nougats. By the excellence of their syrups and nougats the institution received several silver and gold medals that contributed to the popularity of the sweet shop. 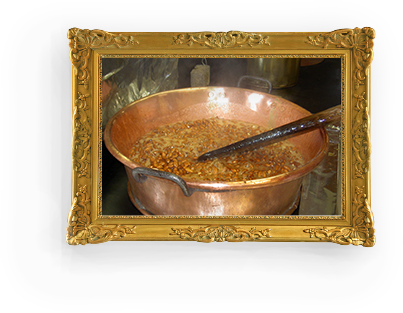 The renown of the institution is mainly due to their ancestral recipe, the secret of fabrication and the rigorous selection of ingredients, in particular almonds and honey. Importantly, since the origin of the institution, the method of fabrication hasn’t changed. We keep in mind the tradition of Christmas spirit in Provence; our fine nougat can only be found from september to december. Our cauldrons and mixing containers are a century old and still in use. Our family, well-known by the gourmets of Provence, respects the tradition of only making nougats for Christmas holidays. Indeed, white and black nougats count amongst the traditional 13 desserts present on the typical provincial Christmas table. For more than a century and as secretly transmitted by Batistin Fouque, the same recipe is used with respect for the rigorous ingredient proportion and the critical cooking time. In respect to the tradition, local villagers pack nougats at the chimney corner relating the last news of the village. For a long time the Fouque Nougat has not only seduced the local area but has been distributed all over Provence. The gourmet brotherhood has extended its circle more recently, orders of our Nougat have also been sent to the united states and elsewhere, probably to people nostalgic for Provence who are missing the sweet flavor of honey and almonds.